Machel Montano’s voice blares from the speakers as the beat kicks in. Then comes Super Blue – ‘Wine and fling it up, wine and wine and fling it up”! 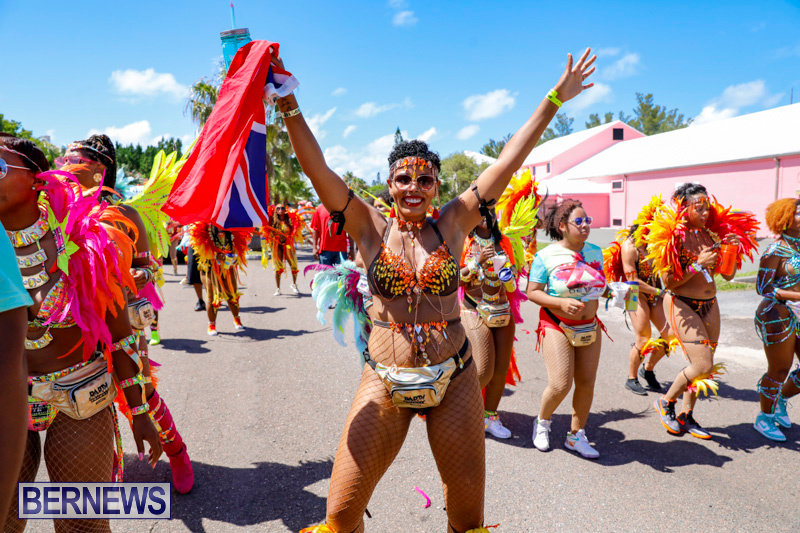 And we surely did wine and fling it up all day yesterday at the crème de la crème of Bermuda Heroes Weekend – Parade of Bands. 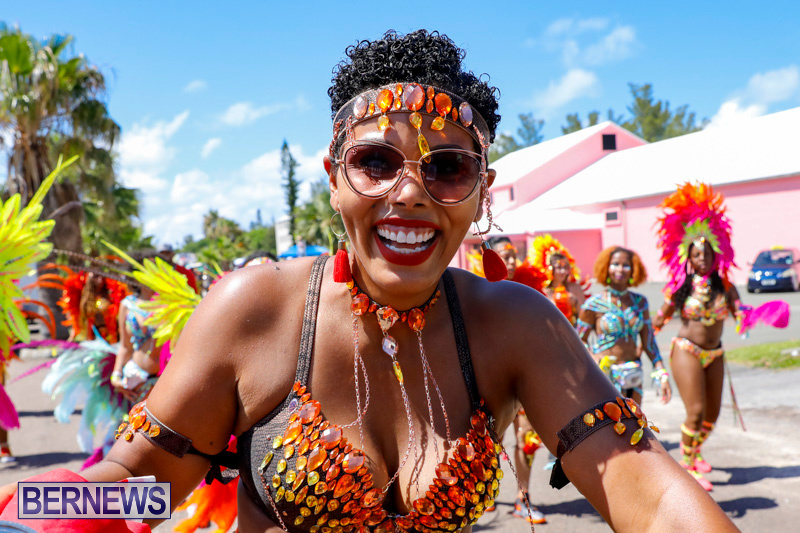 Four bands brought the costumes, the bacchanal and the vibes yesterday during the annual parade throughout Southside. I played mas with Party People this year for a different vibe having played with Nova Mas last time. I arrived at the rest stop area by the old base gate around 1:30pm to start my carnival experience. The first lap started at 10am from Clearwater, but having attended Pure the night before and then J’Ouvert earlier in the morning, I was in no condition to start that early. When I arrived with my cousin, my face immediately broke out into a huge smile seeing everyone dressed in the vibrant colours. Everyone looked beautiful! Once I located Party People’s hospitality area, I grabbed a bottle of water and then did a lap to check out everyone. Shortly after, it was time to hit the road as we were the first band. Party People had two trucks this year for their masqueraders to enjoy. There was also a hydration truck in the middle of the two trucks which was fabulous. I was able to fill my cup with coconut water and ice multiple times throughout the day which kept me hydrated. But the best part about Party People was the vibe. I went in with no expectations and had a ball! The DJs were incredible. There was a mix of local and international including the infamous DJ Private Ryan out of Trinidad, Back2Basic, Tony X, Jim Brown, Mista Genius and more. They were amazing at mixing in new and old soca to get the crowd going. I will say, I did not like the dancehall segment one bit. I am a soca purist and believe there is no room for dancehall in carnival. Fight me. Both trucks were playing similar music but just with different styles. I will say, I stayed close to the truck where Private Ryan and Back2Basics were playing because it was the better truck in my opinion. At one point, Back@Basics, freestyled over the beat when the music had to be shut down and it kept the vibe going. My friends and I actually walked back to check out other bands and I have to say, the vibe was not there. People looked beautiful but were not dancing and basically slowly walking down the road. Maybe it was the heat. Maybe it was a lack of stamina. Maybe there were major hangovers. I’m not sure what it was, but it was discouraging to see so many beautiful people not having a good time. When we finally got to the end at Clearwater Beach, I rushed over to grab some food since I was starving. Unfortunately, the food was horrible to say the least. Other bands had wonderful spreads with a variety of options and Party People had rice, chicken or fish and salad, which took forever to be handed out. It was very disappointing not to mention completely unorganized, which was weird since Party People is a very organised band. Despite the bad experience with the food, I thoroughly enjoyed my time with Party People. The costume was beautiful and the band was full of vibes. I had a wonderful day on the road and will happily do it again next year. It was wonderful seeing so many spectators on the sidelines and people really enjoying themselves. See you next year! I would like to add a suggestion to BHW. 1. Similar to Bernard’s Park, were they have persons clean up the field; they should also have persons to clean up the cups, bottles, etc. left under the water at Shelly Bay. 2. I would also suggest consider having floating trash cans that are monitored/checked and emptied during the day. 3. A BIG suggestion for me is to change the raft up back to Monday. This would allow persons to enjoy the boat race first before partying. More importantly supporting our local tradition. With the current format many of the younger folks have no knowledge about this race. In support of this suggestion as stated by the writer of the article, folks are tried from partying the night/morning before and could not make lap 1. As such the first lap was very flat. Just my two cents to make carnival better. I’m glad you had a great time, but that music through the night thing – it has to stop. Everybody on our street was talking about it – I can’t believe the government allowed it, families were up all night. Happy holidays for some, but not for the majority…. Had a great time as well but only because of the people I was with. If Bermuda wants this thing to take off someone else needs to organize it. no food, no drinks- just an insanely priced costume. not to mention all the drama with bhw/passion and nirvana this year…. No no no it will not get stuck and stagnant because carnival is not about spectators period. It is all about the masqueraders; sure having spectators is fun but ultimately, it’s not meant to be a parade like Bermuda Day. The long gaps is because the trucks often stop and let masqueraders party. It is essentially a street party more than a parade in the traditional sense. So you want North Shore and Palmetto Road completely closed down an entire afternoon? Wouldn’t that go over big with the many residents along those routes! Southside makes much more sense as it’s away from the busy main roads plus it’s a lot more spacious. I say leave it where it is! why are we tyring to do this ‘carnival’ thing AT ALL! it has NOTHING to do with Bermuda and Bermudian Heroes. and this is why it’s halfa$$ed. if i want to carnival, i’m going to the real places like Trinidad, Brazil, and New Orleans. It was popular enough to get renewed on an ongoing basis so I fear your outlook is in the minority shrew. Tying in the carnival aspect to actually celebrating national heroes, well that’s something that ought to be in place but for whatever reason Govt doesn’t appear to care and BHW is focused on putting on the events to make the $. And there’s virtually no outcry from the public in general. Was there even a ceremony to honour the existing Heroes this year? I’m wondering what your thoughts are on carnival and cultural appropriation? This never was our culture as Bermudians, and this foreign culture should not be pushed on us. It does not represent our Christian values, which our island was founded upon. The number of thongs and g-strings in public combined with sexual dancing is beyond disgusting and illegal. I know for a fact it is a crime to be scantily dressed in public, even with swimsuits. So why this illegal double standard, Bermuda Police and Government? Public intoxication is okay? In front of children? This heathen practice has to stop before it tarnishes us any more. This seems like one of those satirical sketches based on a PM talking point or something. That, or there’s an Amish movement that’s arrived in Bermuda. Clean up properly is definitely high on the improvement agenda. On another note surely Ms. Pearman must be in real need of major sleep, to not just attend all these festivities, but participate AND supply journalistic content! Props.